Queensland is known to be one of Australia’s motoring capitals and it isn’t too hard to see why. There are literally hundreds of events organized each year in the state that cater for all types of motoring enthusiasts and getting involved in one is all part of the fun. Since 2013, tougher penalties were introduced relating to traffic offences which gave police more powers when it comes to the states anti-hoon policy. Tougher penalties applied to reckless driving and hooning offences that can result in vehicles being impounded or permanently confiscated. As word spread, motoring enthusiasts became more reluctant to display reckless driving on public roads, instead looking for alternatives on how to get their motoring fix. Car clubs became more popular and memberships were growing. Queensland was quickly becoming a state for motoring fanatics and organizers are clearly on the right path to encourage young people and all motoring enthusiasts to have fun in a safe controlled environment. Whether it is classic, vintage or muscle car shows that you are interested in, finding the next big racing event in the calendar or looking for simple car tips and tricks, The Queensland Street Car Blog has all the latest for motoring enthusiasts. Targa Great Barrier Reef – is one of the most exhilarating events in the calendar year. Taking place in Cairns in late August and early September and spread out over 200 kilometres on some of Queensland’s most exciting roads and landscapes. Targa GBR is an event that is sure to amaze and impress all street car enthusiasts. More information can be found at targa.com.au. JP Racing Drag Fest – takes place at Warwick Dragway and gathers street cars all over Australia. Brackets include open vehicles, teched race cars, fast street cars between 6 and 8.5 seconds, traditional street cars above 8.5 seconds, supercharges and street bikes. More informationcan be found at warwickdragway.com. Australian Street Rod Nationals – showcasing classic and vintage hot rods with over 1400 cars coming together for the 24th Australian Street Rod Nationals in Queensland. 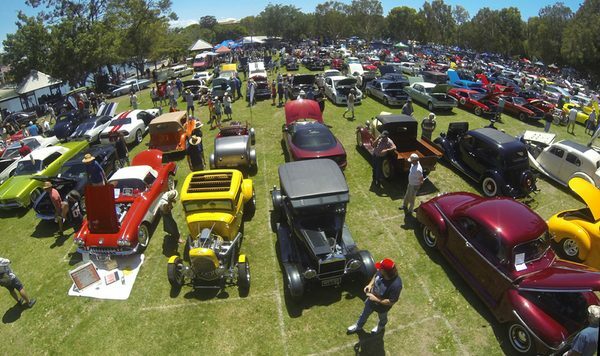 Hot Rods from all parts of Australia are on display to show their pride and joy, there will be displays, trade stands, driving events and lots of fun activities for all ages. More information can be found at 2019asrfnationals.com.